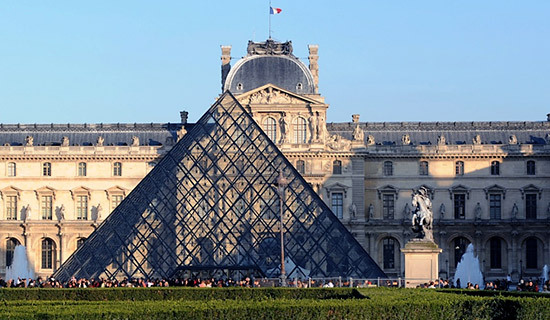 THE MONUMENTS OF PARIS - The richness of the " City of Light "
Paris monuments are among the most visited in the world : the city attracts indeed millions of visitors each year. The French capital is allowed continually discovered and rediscovered over the walks along the Seine or the historic streets. 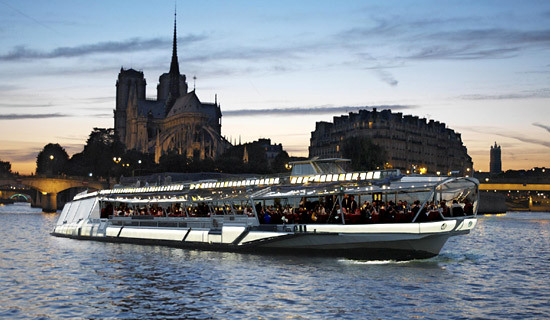 To get acquainted with the city of light, we invite you to discover many sightseeing attractions and just get all the necessary information to plan your next visit. Symbol of Paris, the Eiffel Tower welcomes nearly 7 million visitors every year. This is the major monument of a stay in Paris. 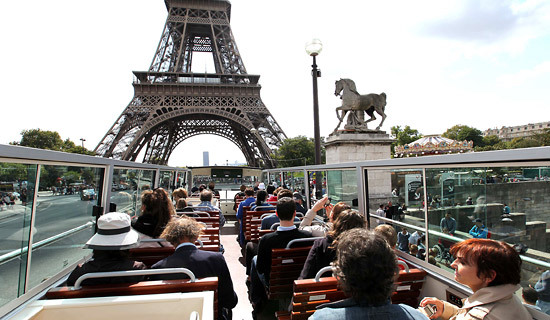 Casual tourists discover it, and Parisians love coming back there. Who has never dreamed of climbing to the top of the tower which makes France so famous, and lose his view of the immensity of Paris ? Sensational, emotional, romantic,... 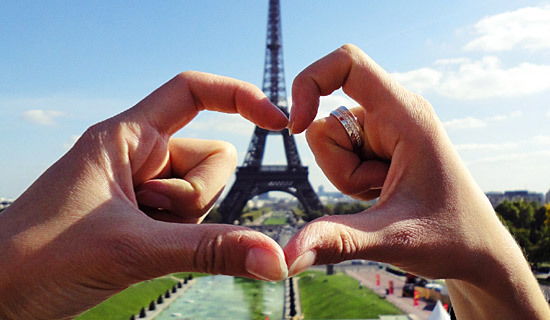 The visit to the Eiffel Tower will always be a special moment during a stay in Paris. 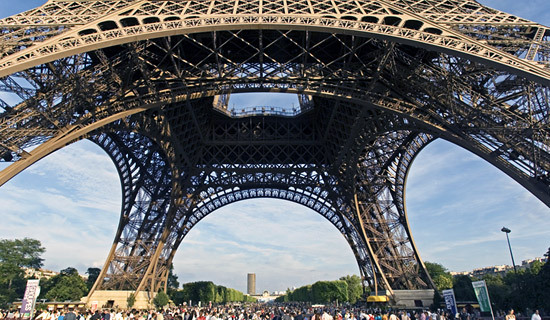 You can climb the Eiffel tower by lifts that allow you to access the 1st and 2nd floors. To access the 3rd floor and top of the tower, you have to change elevator. You can also choose the stairs to see the monument from all angles and enjoy a ride of some 704 steps that lead you to the 2nd floor (access to the 3rd floor making exclusively by elevator). With its transparent floor and its new facilities, the 1st floor is now one of the most spectacular places and most attractive in Paris. Stroll 57m ground on the glass floor and experience the unique sensation of walking above the void. A view on the 1st floor : an immersive spectacle immersing you into the world of the Eiffel Tower, a cultural journey to discover along the exterior walkway allowing you to discover the often overlooked aspects of the Eiffel Tower, and rest areas and contemplation, catering, shop welcome you for a pleasant break with a completely unobstructed view of Paris. With panoramic views of Paris, the 2nd floor is the place to make a photo report. It is also on this floor of the Tower that we take elevators to reach the top of the tower. Take a few minutes to watch the animated displays. They evoke the construction of the Eiffel Tower and explain the operation of the old hydraulic elevator that served the summit until 1983. You will also learn how the existing lifts. Also on this floor is a glazed window that offers a view down to the ground. An original angle for great pictures provided they do not suffer from vertigo. It is 276m in height that emerges a striking view of Paris and its monuments. On this floor is the famous Gustave Eiffel 's office which was reconstituted. Composed of realistic wax figures, this space evokes the builder of the Tower and his daughter Claire receiving the famous American inventor Thomas Edison. It shows, among other phonograph he offered to Gustave Eiffel. You can also see a model of the top of the Tower of 1889, made the 1/50th scale and painted in the original color of the Tour "red brown". Finally, guidance panels are arranged on top of the tower to spot and appreciate the directions and distances from major cities worldwide. Whether for lunch, dinner or just a snack, the Eiffel Tower offers numerous dining experiences along its 3 floors. 58 Tour Eiffel : Picnic lunch or dinner trend? Live a unique experience in the new restaurant on the 1st floor : 58 Tour Eiffel. A kitchen that is both simple and tasty in a friendly atmosphere. The Jules Verne : the inescapable restaurant of Paris to discover the contemporary French cuisine. Be surprised by exceptional cuisine punctuated with new flavors and delicacies, all in a design and a neat atmosphere. What put all your senses to an unforgettable experience. The Champagne bar : Enjoy a unique and original moment in the champagne bar at the top of the Eiffel Tower. The counter, located in the structure of the monument, offers the choice of a glass of white or rosé champagne served wish to charge. An elegant and festive touch that will accompany perfectly the experience of sensations at the top of the Tower. Buffets : The Tower has several spacious buffets available at all hours for your small appetite : snacks, sandwiches and drinks to enjoy at the shelter or outdoors. The perfect place for gourmet pleasures. 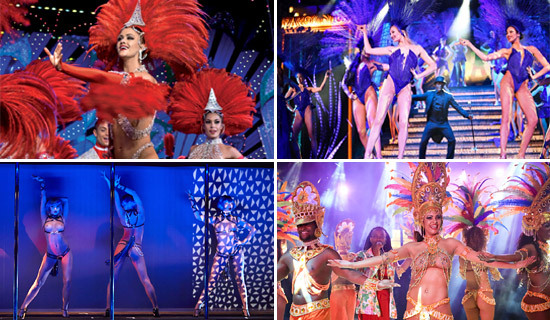 For a moment of magic more intense, be present before the ride on the Champs de Mars any night of the year. At nightfall until 1am, it twinkles for 5 minutes at the beginning of each hour of 20,000 bulbs. Located on the Place de l'Etoile, the top of the Champs-Elysees, the Arc de Triomphe is the largest arch in the world at 50 meters high, 45 meters wide and 22 meters deep. Its construction dates from 1806, at the request of Napoleon, to celebrate the victory of the Emperor at Austerlitz. The architects Chalgrin, Joust and Blouet realized the monument. The sculptures are signed Cortot, Rude, Etex, Pradier and Lemaire. Under the arch is the tomb of the Unknown Soldier. Established November 11, 1920, it is an unidentified soldier ( French recognized ), which represents all the soldiers killed in the First World War. In 1923, an eternal flame is lit, it is rekindled every evening at 18:30. At the top of the monument, visitors can enjoy a panoramic view of Paris, day and night, and two orientation tables. Visit the monument is a time filled with history and architecture that traces the different French battles and honors all the men who participated there. The triumphal arch is divided into 4 levels. The median : Admire on the inner walls of the engravings of the names of battles and wars of generals led by France during the Revolution and the Empire. On the other side of the pillars discover the magnificent sculptures depicting "voluntary departure of" said "La Marseillaise". And of course the ground are inscriptions commemorating other events such as the proclamation of the Republic, the return of Alsace... and of course the inevitable flame of the Unknown Soldier ! The mezzanine: A floor where are reconstituted the triumphal arches of ancient Rome built by Titus, Septimius Severus, and Constantine. The attic room : This floor is for 1834 to present architectural and sculpted models. bronze palms on the walls render homage to the memory of the Unknown Soldier. Governing scenery created in 2007 offer an original reading of the monument. The terrace : It is at the top of the Arc de Triomphe. From the terrace you can discern the dominant position of the Arch in the center of the Place de l'Etoile, and enjoy panoramic and breathtaking view of the Champs Elysees to the Arc du Carrousel at the Louvre, through Tuileries gardens. On the other side your eyes shall continue until the Grande Arche of the famous Parisian business district of La Defense. Of course, this is also the opportunity to enjoy Paris as you do not do often! Allow an hour to visit the monument. Finally, a museum on three levels with history and technology, is under the Arc de Triomphe. It was recently renovated and now the course is very interactive. Notre-Dame de Paris, a masterpiece of Gothic architecture, is the most visited monument of France. Located in the historic center of Paris at the end of the island of the City, its construction began in the Middle Ages. Work began in the thirteenth and was completed in the fifteenth century. Badly damaged during the French Revolution, the cathedral was the subject of a restoration in the nineteenth century led by the architect Viollet-le-Duc. Today, many visitors come to admire the stained glass rose windows, towers, arrow and gargoyles. They can also discover the treasure of Notre Dame and attempt the climb towers to enjoy a magnificent panoramic view of Paris. Anecdote, all road distances in France are calculated from point 0, which is located on the cathedral square. Another circuit not to be missed is the one of the towers of the cathedral. 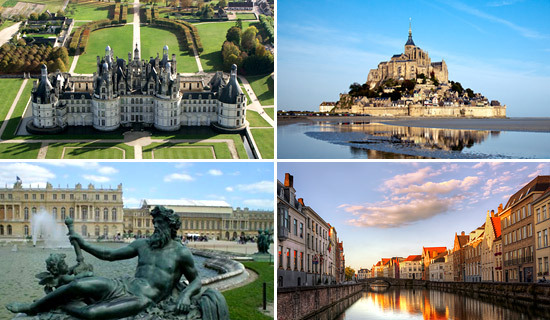 This tour allows you to visit all the high parts of the western facade dating from the thirteenth century, to contemplate the gargoyles and fanciful sculptures built by Viollet-le-Duc in the nineteenth century and the Bourdon seventeenth century. 387 steps with no lift to reach the top of the South Tower and can thus contemplate Paris. It is also possible to visit the archaeological crypt is located under the front of Notre Dame. Access is by stairs located opposite the cathedral, near the police headquarters. The archaeological crypt was constructed to protect the remains discovered during excavations in 1965, the Old Paris Commission (Department of History of Architecture and Archaeology). This space was opened in 1980 with the objective presentation of the elements of the buildings that have succeeded on the ancient site of the nineteenth century. Finally, it is also possible to come and participate in services in the cathedral every day of the year between 8:00 and 6:45 p.m. ( 7:15 p.m. Saturday and Sunday). 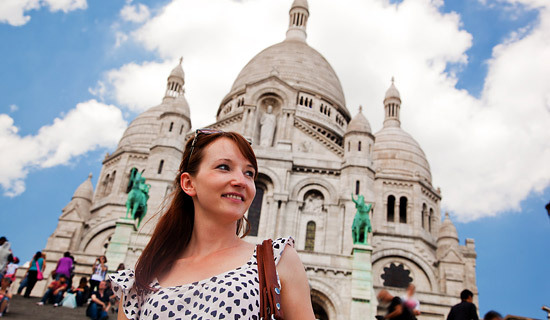 With over 11 and a half million visitors a year, the Sacré-Coeur Basilica, located at the top of Montmartre, is the second most visited place in Paris (after the Notre Dame Cathedral). Also called "National Vow" and consecrated in 1919, the Basilica offers one of the most beautiful panoramic views of the capital, more than 400 meters. The Romano-Byzantine basilica is recognizable by its white color. Inside the building, the ceiling is decorated with the largest mosaic of France, measuring 480 sqm and it is also possible to visit the crypt. Similarly, you can have more height by accessing the dome where the view of Paris 360 is beautiful. Since time immemorial, Montmartre has been a place of worship, prayer and today Mecca remains faithful to its tradition. The Sacré Coeur Basilica is a place of perpetual prayer, day and night, with a special intention for peace in the world. Its architecture has inspired many other religious monuments in France, including the Basilica of St. Therese of Lisieux, a major pilgrimage center in France. The central dome of the Sacré Coeur Basilica is made of stone and appears to be the second highest point in Paris after the Eiffel Tower ( 83m building, but built on a hill top 128m ). The entrance to the dome and the crypt is located on the left side facing the basilica. From the top of the dome, you have a magnificent 360° view of Paris and other symbolic monuments. Access to the dome is by outside the Basilica, on the left side. Attention to the rise in the Dome, there are 300 steps, no elevator ! The centerpiece of the Basilica remains the huge mosaic on the ceiling of the apse. Covering an area of 473,78m², this mosaic is the largest in France. Built in 1922, four years it took to achieve it. The great organ of the Basilica of the Sacred Heart in Montmartre is unanimously considered one of the most remarkable in Europe. Built in 1898, the last major instrument of renomé Cavaillé -Coll. The Savoyard, the largest bell in the world! The bell tower houses the famous "Savoyarde". From its 19 tons is the largest bell in the world. His tone is very characteristic. It was donated by the four dioceses of Savoy and melted in 1895 in Annecy by the company Paccard, whose fame dates from this time. She had to be pulled by 28 horses to be sent to the Basilica. You will be impressed by them entering through the arches in pure style which form a large ambulatory able processions (Eucharistic processions on the first Friday of the month, Way of the Cross on Fridays of Lent...) and dotted with large stone statues (those St. Denis, St. Genevieve, St. Ignatius, St. Francis Xavier...). In the middle of the Crypt is the chapel of the Pietà, supporting the nave, which contains a monumental statue of the Virgin at the foot of the Cross. For visits the entrance is through a door in the west aisle. If not for ceremonies (procession Reposoir Holy Thursday...), the entrance is outside on the west side of the facade, a staircase and two bronze doors. Prayers to the Sacred Heart are 24/24, symbolizing perpetual adoration. Founded in 1765 by the Roman Catholic Church, the Sacred Heart is the devotion to the Heart of Jesus, symbol of Divine Love when the Son of God took human form and gave his life for mankind. The Sacred Heart is represented by a flaming heart, surrounded by divine light and tight in a crown of thorns. Located in the heart of Paris, in the Marais district, the Centre Pompidou reveals its unique architecture, timeless and modern, offering visitors a beautiful view of the capital from the upper levels. The Pompidou Centre welcomes every year almost 25 exhibitions that make event with highlighting masterly figures and founding movements in the history of art of the twentieth century and the greatest artists of the contemporary scene. There is a rich cinema programming, theater, dance, concerts, conferences and seminars, spaces for young people, public library information. Shops and restaurants complete this artistic grouping and the Pompidou Centre are a unique multidisciplinary place in the world. A modern art museum, Matisse, Picasso, Chagall and others if you want to delight you with their works (4th floor). A contemporary art museum, which offers view and to question topical works, sometimes bizarre, often very fresh and of course very interesting. The BPI, a very large library very well organized and complete. Cinemas for projection of non- mainstream films. A concept design store to buy souvenirs. Areas for children / cultural awakening for children. A basement offering smaller single exposures but without interest. A restaurant with a beautiful view on the roof. A small terrace with sculptures with a little rest and a breathtaking view. And other areas that will not surprise you !